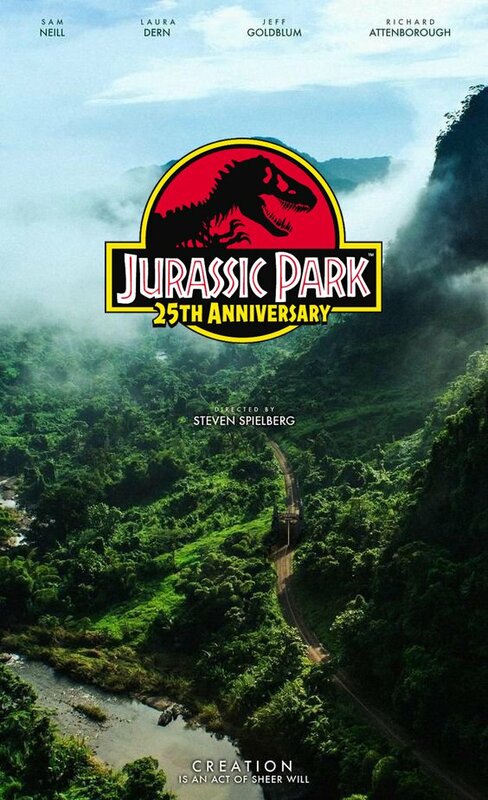 Jurassic Park celebrates its 25th Anniversary. I take a look back at the 1993 classic. 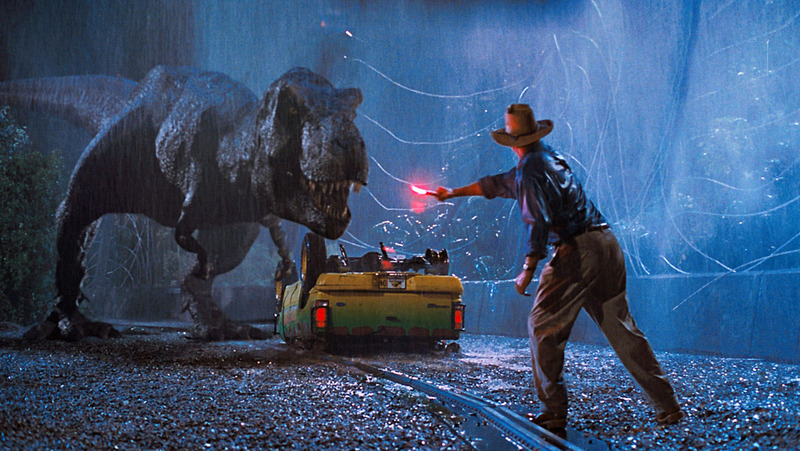 When I first watched Jurassic Park back in 1993 I knew the film directed by Steven Spielberg would become a classic. 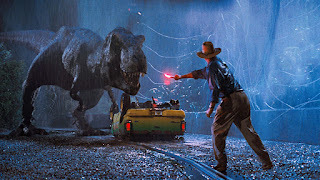 The CGI dinosaurs coupled with the genius of Stan Winston’s animatronic T Rex made Jurassic Park a cinema experience that would never be forgotten. The story is straight forward. John Hammond who has oodles of money has this idea of a tourist attraction on a island but instead of staff dressed in costumes, Hammond’s plan is to have a park full of dinosaurs. Using DNA from dinosaur blood which was found in mosquitoes, trapped in amber. Scientists filled in the gaps with frog DNA and BINGO, Dino DNA! T-Rex’s, Velicopraptors and those creepy little ones that spit deadly poison at your face are just a few of the dinosaurs roaming around freely on the island for rich guests to enjoy and look at in awe. Of course approval and endorsement is needed first and what better way than to send a couple of scientists, a chaos theorist and blood sucking lawyer. Oh and Hammond’s grandchildren tag along too. What could go wrong? Well as it happens a lot especially when you mix in staff who are working on the island who shut down the system so they could get their grubby little hands on the priceless DNA. Of course this leads to a dinosaur free for all and lawyers hiding on toilets don’t stand a chance. “I didn’t make it to change the way people say the world. I made the movie because it was entertaining and it was the kind of movie I wanted to see. I always wanted to do a dinosaur movie so in a sense this was my hobby movie." 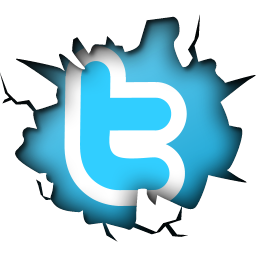 I like that. All to often directors and movie makers take their movie far too serious trying to find a deep hidden message behind their film or they try to make it a life lesson to all. Spielberg made Jurassic Park to be an entertaining fast ride from start to finish. 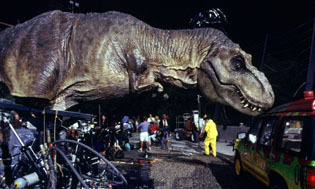 The CGI coupled with the animatronic dinosaurs from the talented and missed Stan Winston workedbeautifully even if the giant T-Rex Winston created kept malfunctioning on set due to the water used for the rain kept getting into the mechanism of the dinosaur causing it to shake like an old man on set. Once again Spielberg called upon John Williams to write the soundtrack and of course the composer didn't disappoint. What is one of his finest soundtracks I have had the theme tune in my head every single day for 25 years and I'm not complaining. One piece still sends shivers down my spine and that piece is Journey to the Island. Next time you get the blu-ray out or DVD find the scene with the helicopter flying over the island and whack the sound up. Fabulous! Jurassic Park won three Oscars. Sound mixing, sound editing and of course visual effects. In 2013 with it’s 3D release and Chinese cinema release the Jurassic Park franchise joined the $2 billion box office takings club. With yet another Jurassic World out in June that number is set to grow and grow. Finally before I go lets take a look at a few bloopers. First at the beginning of the movie. In the opening scene, a velociraptor is being introduced into the park from a shipping container. The velociraptor runs into the gate as it opens, knocking Jophery off the top; he falls to the ground and is attacked. As he falls, two hands come in to break his fall and prevent him from hitting the camera. Secondly sticking with visible crew members watch carefully the scene where the raptors enter the kitchen (that angle where you can see almost the whole kitchen while raptors are coming in from the far away door). As the first raptor enters the kitchen, you can see someone grabbing its tail to hold the puppet-thing steady. Classic movie never age and Jurassic Park is one of those. A timeless classic directed by a director who wanted a good dinosaur movie that he himself wanted to watch. He was wrong, it’s a movie we all want to watch time and time again.